more pictures to be posted...soon! 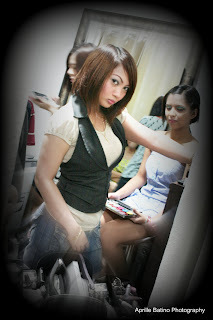 sis ..i love seeing you "in action" :D super pretty inspiration and super nice look! Congrats again sis! I am so proud of you! Fiona looks gorgeous, thanks to you. I love what you did with her make-up. Very artsy and colorful! grabe kapag pumupunta ako sa site mo parang gusto ko na magpa-make up! idol talaga kita!